Cascade Lodge is a perfect place to host your next meeting, retreat, or a family reunion. We offer various event space options that best suit your event and we are always happy to go the extra mile to ensure that your event is well organized and perfectly executed. From intimate gatherings, gregarious family reunions, and team building getaways, we have an ideal space and setting for your group. One of our friendly staff members would love to assist you with your family reunion, work retreat, or a meeting. 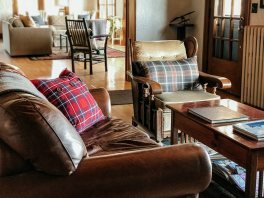 Main Lodge, built in 1937, features a spacious room with a hardwood parquet floor, stone fireplace, grand piano, wood ceiling beams, and the incredible view of Lake Superior. Cascade Lawn is a large area surrounded by the forest and Lodge cabins. This lovely site has an easy access to a large outdoor fire pit area and has a direct trail access. Cascade Lawn is easily accessible from all property cabins/rooms. The Lawn is perfect for medium to large size groups, or any groups that may require ample space for gathering, playing horseshoes or golf toss, or just enjoying a large outdoor space. Built in 1947 and serving guests ever since, our restaurant and pub is known for the authentic North Shore hospitality and ambiance. 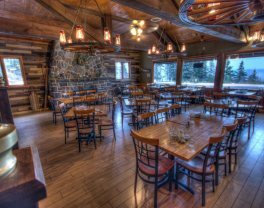 Stone fireplace, historic wagon wheel light fixtures, and amazing views of Lake Superior make Cascade Restaurant and Pub a perfect locale to host your event.